I was confident I could finish work on my mom’s HHR today. 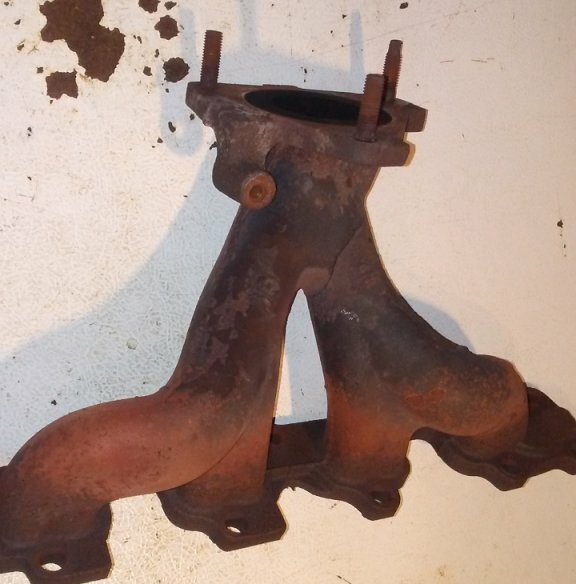 The exhaust manifold begged to differ. The split goes almost completely around. Now I get to go wrench on a car in the junkyard in the morning! looking forward to people dumping their R32’s in the US when R34s are legal. Always prefered the 32 and i plan to take advantage of the price fluctuation. Is this something that could be brazed together or does the manifold get to hot for the braze to stay? 34s are holding their value pretty well (nowhere near as cheap as you can get 32s and 33s), i doubt people will be dumping their 32s either as plenty of people like them. (in australia where all 3 have been legal since forever). there’s already people selling 32s to get 33s and the 33s aren’t even that popular. Do i think it’s going to be a massive drop? no but it’s probably going to be the best time to buy. 33s are cheap (as you say, they aren’t popular, but they ARE significantly newer). 34s aren’t unfortunately. personally if i had a 32 i’d be holding onto it, as they’re the classic godzilla that dominated group A around the world and will (I feel) be more collectable. 34s over here have shot up in value actually, looking on the local car sales site they’re $150-300k aussie now for a decent one. could have had one a few years ago for 50-60. 33s you can pick up for 50 ish here now. i suspect by the time 34s are legal over there, you’re going to have an issue getting hold of one out of Japan or elsewhere as they’re already now being held onto and the value of 34s has skyrocketed. people over here in Australia and NZ have had the pick of what’s been available in Japan for years now. My old manager imported and R32, but he has it up for sale for $12k. Less than almost all RX7 FDs, or a Honda S2000s. Gotta be a GTST with the RB20 eh? Yup. It’s a type-M, not that I really know what that means. It’s not worth it, the crack would already be completely across if there wasn’t some casting markings on the opposite side that stopped it. I saw one in the junkyard with a small crack a few months ago, so I knew this was a possibility. I have seen people fix it by drilling holes to stop it from spreading, and peening metal in to stop the leak. I vaguely remember seeing it done to an old cast iron head combustion chamber, so that can work quite well. With how bad it is, and only ~$20 at the junkyard I’m just going to replace it. They cut all of the exhaust systems close to the manifold, which is bad if you need the pipe, but great for me as I don’t even have to lay on the ground to unbolt it from the engine. Considering pretty much all of the other work went very smoothly, this isn’t a big headache. The drive across town will be more of a chore! I like em a lot. Do you have the gray or black interior? It’s amazon so if you don’t think the build quality is up to snuff you can send them back. Just need some decent seats, not leather. Using stock seatbelts and stock slides. As long as the recliner isn’t wobbly I don’t know what else to worry about. Seat websites are $700+ for a cheap pair. Not sure what makes them so expensive. Maybe a rating for harnesses or crash testing? Maybe a rating for harnesses or crash testing? This. You know you’re buying a seat that won’t kill you in a crash. I think that’ll look great. A battery pack replacement cost 1,000$. And a new induction motor would cost 20,000$ and up when it is time for a replacement. But they cannot be rebuilt. And has to be replaced much more often than any regular service vehicle. It seems like a electric service vehicle is much more of a money pit than it’s diesel or gas competitors. It seems like a electric service vehicle is much more of a money pit than it’s diesel or gas competitors. At the moment, yeah. People say there’s no maintenance, which is true, but when you need repairs, you’re getting raked over the coals. i would never buy a seat without sitting in it first tbh. AvE would fix the electric motors.